PTTEP, Thailand’s national petroleum exploration company, occupies eighteen floors in the recently completed ENCO building in Bangkok. It consolidates the various head office functions previously spread across a number of sites. 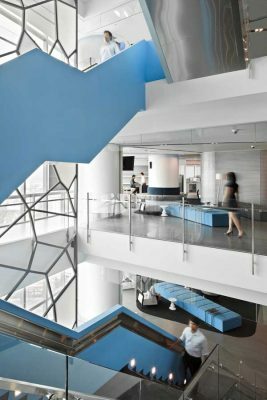 The competition-winning design by HASSELL creates an open plan workplace that is configured around a new internal stairway that provides a physical and visual link between all eighteen levels of the 45,000 square metre tenancy. Breakout and hub spaces are situated adjacent to stair landings to encourage staff interaction and promote visual connection between departments. Utility rooms are located around the central core ensuring work space areas are positioned with close proximity to natural light. This open plan approach is a significant change for PTTEP and has enabled them to strengthen the culture of the company. The colour scheme for the interiors was inspired by the luminous gas flame associated with oil exploration and production. The gradation of colour in the flame informed the colour palette and helped to create a unique identity across the floors. This ‘Colour of Flame’ concept was the key component linking vertical spaces, as the stair and floor group colour coding changed from green, through blue, light blue, yellow and red as it rose up the building. At night this element becomes a highly visible external statement. The introduction of a dedicated client floor complete with meeting rooms and extensive audiovisual facilities enabled PTTEP to maximise the general workplace facilities on other floors. A separate executive suite, occupying the top three floors of the building, accommodates all management facilities. Two landscaped external roof decks provide additional space for staff recreation and other corporate activities. Established trees and vertical wall climbers create a lush and green environment to complement the building’s glazed truss parapet.